Nick Kristof and Bill Gates have a Facebook Live discussion about the #1 invention that has saved more lives than others: The Toilet. Here's their Ode to the Comode! Menstruation. Periods. Time of the month. The Curse. These stigmatized words carry with them significant educational, health, social, and economic consequences for girls and women all over the world. The lack of toilets, privacy, menstrual hygiene, and sanitation resources results in girls missing up to five days of school every single month. Many students cannot afford or don’t have access to basic menstrual hygiene products such as sanitary napkins, and must use unsafe alternatives like old rags that put them at risk for reproductive tract infections and other health issues. May 28 is Menstrual Hygiene Management Day. FSW co-authored a piece with Brian McLaren. Brian is a very popular, progressive Christian author, inspiring speaker, and all around excellent human being who's traveled the world and knows the value of a decent toilet! FSW co-authored a piece with Dr. Christine Sow, an well-known expert in global health and president of the Global Health Council in Washington, DC. After a New York Times best pick at the NY Fringe Festival, friend of FSW, Sean the Puru, opens at Fringe Festival in Scotland. Your friends at FSW are flush with pride! Faiths for Safe Water was honored to participate in the ﻿﻿2015 Parliament of the World’s Religions﻿﻿, October 15-19 in Salt Lake City, Utah. We shared the podium with Dr. Sol Katz, a Parliament Trustee and expert on Food Security. We also had the once-in-a-lifetime opportunity to interview Dr. Jane Goodall and ask her, among other things, about her take on the global water crisis. The Parliament is the world’s oldest, largest and most inclusive global interfaith gathering, hosting 10,000 global and religious leaders, grassroots activists, and practitioners from 50 traditions and more than 80 countries. The goal is to build bridges -- together -- to a more peaceful, just, and sustainable world. 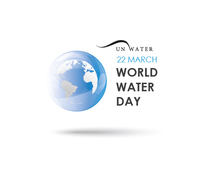 ﻿HAPPY WORLD WATER DAY 2015! OUR FRIENDS AT THE COUNCIL for a PARLIAMENT of the WORLD'S RELIGIONS ARE ON BOARD WITH US ON WORLD WATER DAY! Keeping projects up and running is half the battle.﻿ So Google Impact Awards is funding CHARITY:WATER to develop sensor technology that will detect whether water is flowing at any of its projects, at any given time, anywhere in the world! This award will help charity:water further advance transparency and sustainability in the WASH sector. WANNA KNOW HOW MUCH WATER YOU USE? CHECK OUT THIS APP, CREATED BY ONE INCREDIBLY INNOVATIVE HIGH SCHOOL STUDENT NAMED ABHA NATH. You think the global water crisis is somebody else's problem? The groundbreaking documentary, LAST CALL AT THE OASIS, brings the problem home to the U.S. Yes, that's US. "Last Call at the Oasis"
Three esteemed leaders from the three Abrahamic faiths joined together at the historic Riverside Church in New York City to call on the faiths to unite around this singular symbol share by all, and make water the source of health and life for ALL. Human existence is about much more than water, but never about less. From birth until death, the faiths share this recognition in ritual, symbol, and need. As faith leaders, they stood together in unity around this symbol shared by all faiths, declaring, we are here because together, we are going to launch something powerful. "...Last year, I called on the intelligence community to conduct a global assessment of the impact water could have and was having on our national security. Today, the National Intelligence Council released the unclassified version of its report on Global Water Security. You can go online, read it for yourself, see how imperative clean water and access to water is to future peace, security, and prosperity, globally. I think its fair to say the intelligence communitys findings are sobering..."
Imam Syed Rafiq Naqvi was born in Lucknow, India where he pursued Masters degrees in Psychology, Philosophy and Economics and Islamic Theology and Islamic Jurisprudence, as well as studies in comparative religions. He serves as the Chairman of IIC, Islamic Information Center, founded in 2002, to create a better understanding about Islam among different faiths, government, and the media.﻿ He is Imam of the Jaferia Islamic Center in Burtonsville, Maryland and works on numerous humanitarian projects in the US and other countries iwth the Universal Islamic Foundation and the Imam Financial Corporation. Together with his wife, they also address issues of women's equality. He is the 2009 recipient of the Ellis Island Medal of Honor. The Very Rev. Dr. James A. Kowalski is the 9th and current dean of the Cathedral Church of Saint John the Divine, New York. He was elected soon after 9/11 and just before a devastating fire struck the Cathedral. The Cathedral has been undergoing restoration and was rededicated on November 30, 2008. Dean Kowalski was recruited to ordained ministry by the Rockefeller “Trial Year” Fellowship in 1973, when he graduated from Trinity College in Hartford, CT. Since his ordination in 1978, he has also served parishes in Newtown, Hartford, and Darien, Connecticut. He is an inaugural Henry Crown Fellow at the Aspen Institute and a Fellow of the American Leadership Forum. He is member of the Board of Overseers for St. Luke’s-Roosevelt Medical Center and a Trustee of Episcopal Divinity School, Cambridge, MA. In 2002, the Dean was awarded an honorary Doctor of Divinity degree by Berkeley Divinity School at Yale. Rabbi Bemporad heads the US-based nonprofit Center for Interreligious Understanding (CIU), which promotes open dialogue, mutual respect, and theological understanding of the common foundations shared by the world's religions. He also serves as Professor of Interreligious Studies at the Vatican's Angelicum University in Rome. Rabbi Bemporad is internationally recognized﻿ for his diplomatic skill and leadership in matters of religious understanding and reconciliation. He has had numerous personal audiences with Pope John Paul II and among his extensive work with Vatican leadership, he was the primary writer of the historical Prague Accord (the first time the Vatican asked forgiveness for past acts of anti-Semitism); and worked with Cardinals Willebrands and Cassidy to help secure full diplomatic relations between the Vatican and the State of Israel. Shortly before Pope John Paul’s death, Rabbi Bemporad and two other Rabbis offered a blessing of the Pope, in recognition of the Holy See’s historic steps to improve relations between Catholics and Jews. Rabbi Bemporad was on hand to greet Pope Benedict on his first Papal visit to Israel. Bemporad’s work reaches beyond Rome. He helped lead an interfaith delegation to Iran with Cardinal Theodore McCarrick, then Archbishop of Washington DC, to address religious tolerance with Iranian President Mohammad Khatami and other key Iranian leadership. He served as Chairman of the Interreligious Affairs Committee of the Synagogue Council of America, where he has represented Orthodox/Conservative/ Reform rabbinical and lay bodies at the National Conference of Catholic Bishops, the National Council of Churches, the Vatican, the World Council of Churches, and the national and international branches of the Lutheran, Presbyterian, Episcopal, and Baptist churches. He led an historic trip of US Imams to the concentrations camps Auschwitz and Dachau where the Muslims leaders emotionally knelt in prayer; and has been outspoken against Islamophobia in the US and abroad. Among his many awards for his efforts to foster interreligious understanding, Bemporad received the prestigious Luminosa Award of the Focolare Movement, the Peace and Tolerance Award by the Interfaith Dialog Center (Turkish Muslims), and was honored by the Friends of the Pope John Paul II Foundation. Fleeing Italy just prior to WWII at the age of 5, Bemporad has dedicated his career to improving relations among Christians, Muslims, and Jews worldwide.